‘Summer wines should be refreshing,” says Steve Gett, wine director at Union Square Wines and Spirits, one of the city’s finest purveyors of the grape. With reds, go for “ripe, lush, juicy lip-smackers,” Gett advises. 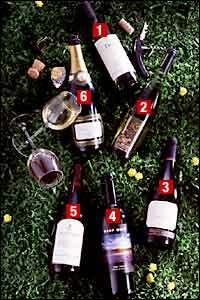 With whites, choose “crisp, fruit-driven styles and avoid overly oaked Chardonnay and other dense wines,” he says. Here, Gett’s summer-cellar must-haves, all at a an economy-appropriate $25 or less. Ignore cheap and insipid Montepulcianos that have given the grape a bad name, says Gett. Check out the serious bottlings from the central Adriatic wine regions that are making this a favorite choice among the Italian-wine cognoscenti. Dezio’s deliciously spicy Montepulciano has fruit flavors like roasted plums and black cherries, plus a hint of mocha. Pair it with grilled portobellos or a juicy steak. Gett calls this “one of the tastiest new Aussie reds.” With blackberry, vanilla, and black-pepper flavors, it’s juicy rather than heavy. Serve it slightly chilled, he suggests, with burgers, barbecued chicken, or ribs. Summer is the season to drink pink, and dry rosés are best, says Gett: Â“You get all those red-wine aromas complemented by a nice coolness.” The Iron Horse rosé offers wild-strawberry aromas, cherry fruit flavors, and a refreshing tang. Try it with Mexican, says Gett.